The rundown of neighbourhood mobility updates that you should know about. Some stations will also be installed in the residential area of Strathcona, including one at Keefer St and Princess Ave by the Strathcona Community Centre. To celebrate their Eastward expansion, Mobi Bikes is having a sale on annual passes. Discounts of $30-$40 are available. Corporate partnership options exist to provide subsidized or discounted memberships to your employees. Furthermore, a pilot equity program for low-income residents is going to be launched in the next few months. 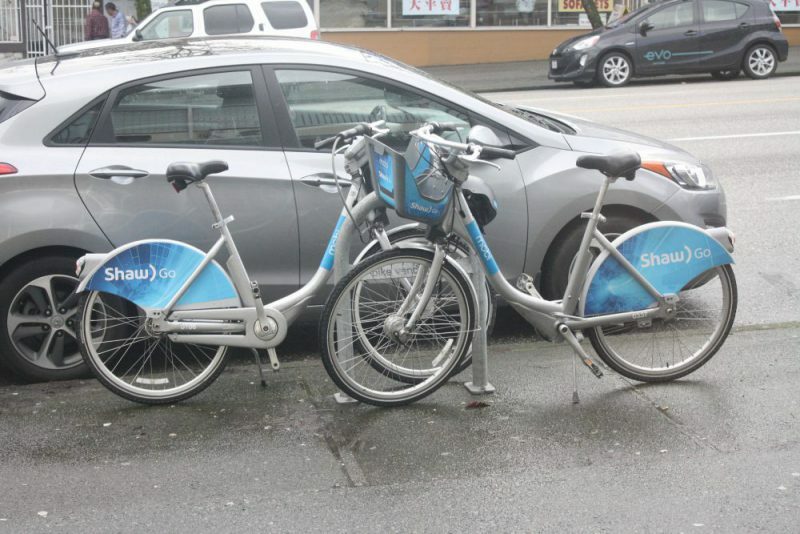 Mobi stations in Strathcona support our Mobility Advocacy Plan objectives of improving employee transportation options and active transportation facilities and connections in the neighbourhood. Not sure if Mobi is the right fit for you and want to test it out first? For the month of May you can get a single 30 min trip for $3, no strings attached! See all your options here. 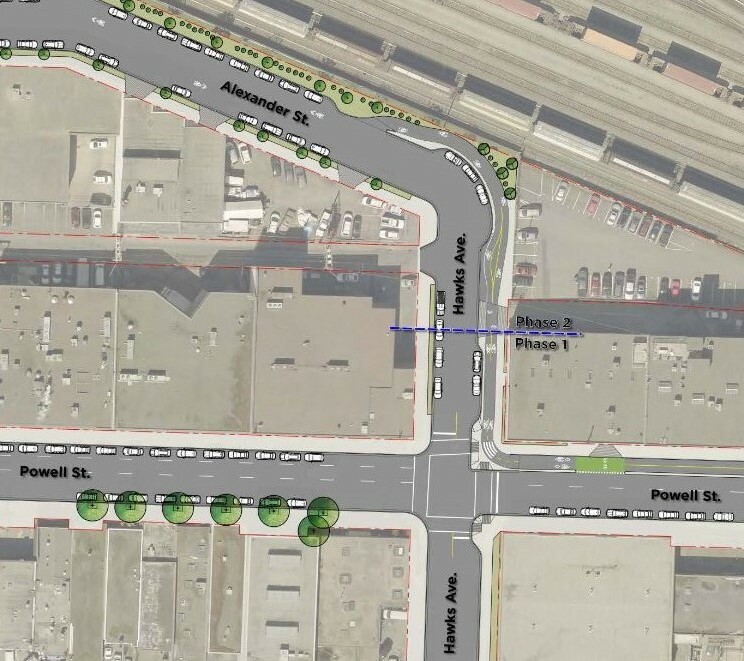 After a year of engagement, the Alexander Street Bikeway has reached the installation phase. The SBIA helped facilitate conversations and meetings between City project staff and adjacent businesses to the new bikeway. The City ended up altering original designs to accommodate an important loading bay for goods movement needs at Powell St and Hawks Ave. The small section of protected path that will be introduced in two phases over 2018 and 2019 has minimal impact on the width of the road, maintains parking, and allows for loading and delivery. The right turn off the Powell St. Overpass onto Hawks Ave. will be banned to reduce conflicts at this intersection. For full details on the scope of work and street changes, including at the western side of Alexander St, please see this letter to businesses and residents. 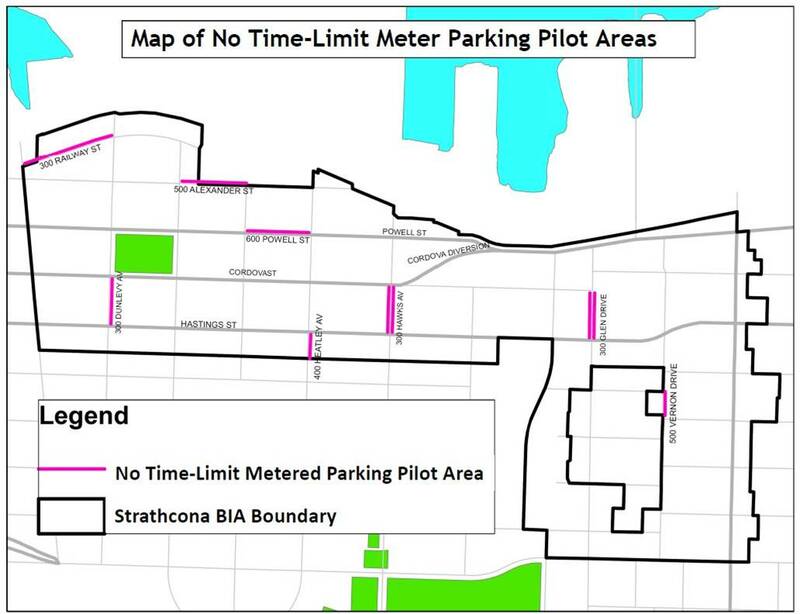 The installation of no time-limit metered parking in the pilot areas above has been slightly delayed. We are starting to see the pay stations installed and they will become operational soon. See this blog post for more details on the pilot. The SBIA has helped conduct outreach with over 40 businesses near the pilot areas and has relayed feedback to the City. We see testing new street parking approaches and solutions, such as flexible time limits, as a potential solution to help better manage both long-term and short-term parking demands on the area. The City will be closely monitoring the pilot’s impact on parking availability throughout 2018 to determine the best way to move forward in 2019 and beyond. Feedback from the SBIA and its members will help the City in its evaluation. The expectation is that this pilot will improve parking performance in the SBIA area. The City target for average observed occupancy in the parking areas of the pilot is between 60% – 85%. Spring Bike to Work Week, brought to the City by HUB Cycling, is happening May 28th�- June 3rd. Bike to Work Week is a community event to celebrate bike commuting across Metro Vancouver. There will be over 80 celebration stations, including a station outside of Landyachtz Bike Shop at 1146 Union all week from 8am – 6pm. Locally roasted coffee by Agro Roasters will be available for riders, plus other snacks and bike maintenance! It’s quick and easy to register for Bike to Work Week online, and you can log your trips all week to win prizes. SBIA is partnering with TravelSmart to help bring their sustainable commuting resources to our members. TravelSmart for Business works with organizations interested in reducing single occupant vehicles driven to their workplace. The TravelSmart team can help you review, evaluate, and improve current travel options for your employees, clients, and customers. Interested in tools and strategies to help manage the demand for parking at your workplace? Get in touch with Johanna at johanna@strathconabia.com.